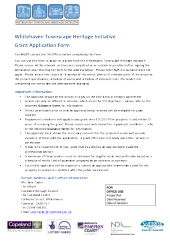 You can use this form to apply for a grant from the Whitehaven Townscape Heritage Initiative. Please ensure all the relevant sections are completed as accurately as possible before signing the declaration and returning the form to the address below. Please enter N/A if a question does not apply. Please attach two copies of: drawings of the works, photos of relevant parts of the property, the project specification, schedule of works and schedule of itemised costs, the tenders for completing the works and the development appraisal.